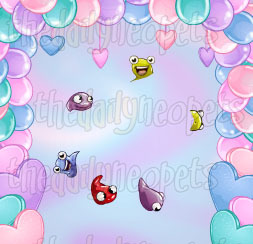 On the 1st of April 2011, many players were frightened upon seeing their pets. An unidentified illness had hit their pet, and seems to have infected their other pets as well. Not being alone, a whole research team in the hospitals are trying to identify this illness after being redirected from the pharmacy so many times. At 12:51:59 pm NST, they discovered that this illness was Scourgies, highly contagious and does not yet have a cure. At the end of the day, 771,449 pets were infected. A poor Tuskaninny infected with Scourgies. 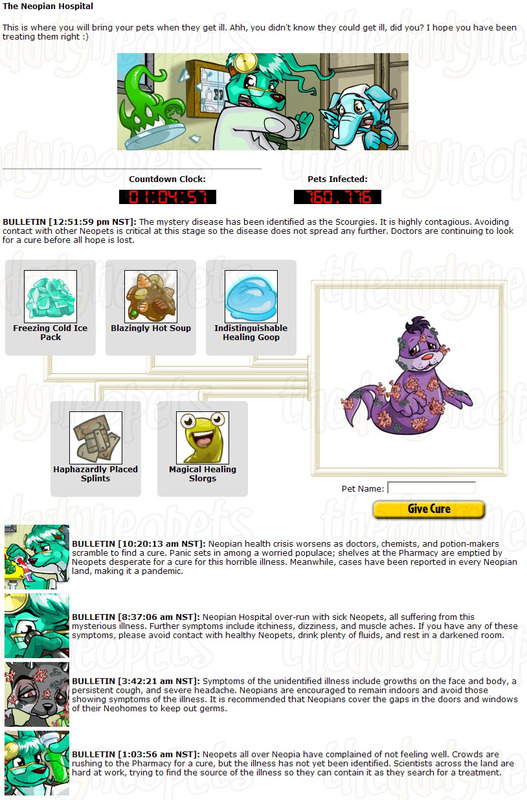 Baby, Mutant and Maraquan pets got infected, however this did not show on their looks because of their appearance. 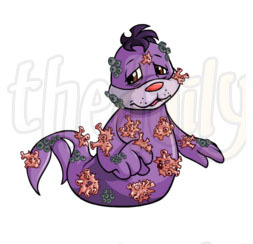 However, Invisible pets would be hit by the infection, which is rather interesting as normally they cannot wear clothes. 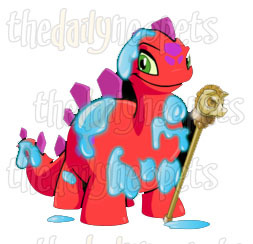 Here is an invisible pet with a temporary cure, namely the Magical Healing Slorgs. Your pet is suffering from an unidentified disease. 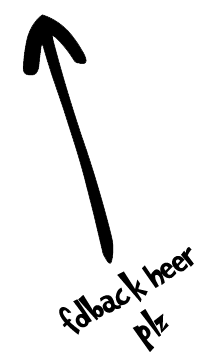 Click here to visit the Hospital. Your pet is suffering from a severe headache and a cough. Your pet is highly contagious and should see a doctor. Your pet is not going to make it if this disease is not cured soon. Your pet has Scourgies and needs medical help immediately. Sadly enough, most of these healing methods only worked temporarily and faded away after 30 minutes. They would be placed on top of the clothes, and would remove foreground items from customization. 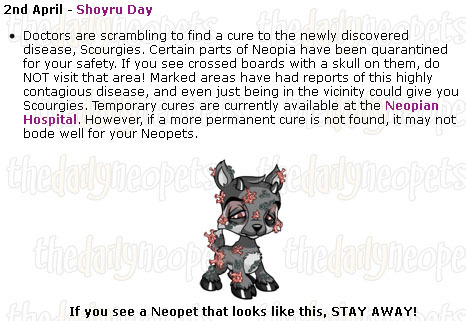 BULLETIN [1:03:56 am NST]: Neopets all over Neopia have complained of not feeling well. Crowds are rushing to the Pharmacy for a cure, but the illness has not yet been identified. Scientists across the land are hard at work, trying to find the source of the illness so they can contain it as they search for a treatment. BULLETIN [3:42:21 am NST]: Symptoms of the unidentified illness include growths on the face and body, a persistent cough, and severe headache. Neopians are encouraged to remain indoors and avoid those showing symptoms of the illness. 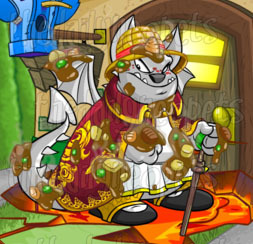 It is recommended that Neopians cover the gaps in the doors and windows of their Neohomes to keep out germs. BULLETIN [8:37:06 am NST]: Neopian Hospital over-run with sick Neopets, all suffering from this mysterious illness. Further symptoms include itchiness, dizziness, and muscle aches. If you have any of these symptoms, please avoid contact with healthy Neopets, drink plenty of fluids, and rest in a darkened room. BULLETIN [10:20:13 am NST]: Neopian health crisis worsens as doctors, chemists, and potion-makers scramble to End a cure. Panic sets in among a worried populace; shelves at the Pharmacy are emptied by Neopets desperate for a cure for this horrible illness. Meanwhile, cases have been reported in every Neopian land, making it a pandemic. BULLETIN [12:51:59 pm NST]: The mystery disease has been identified as the Scourgies. It is highly contagious. 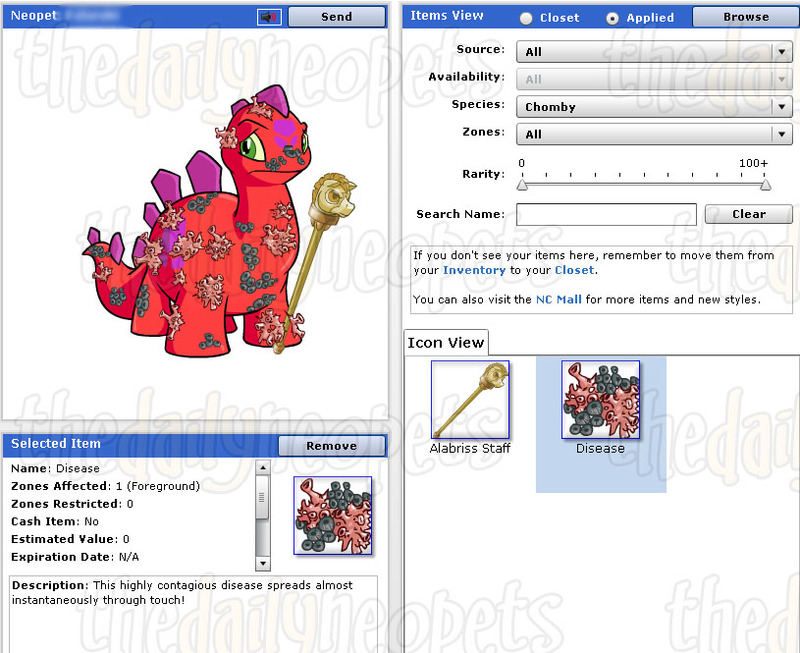 Avoiding contact with other Neopets is critical at this stage so the disease does not spread any further. Doctors are continuing to look for a cure before all hope is lost. 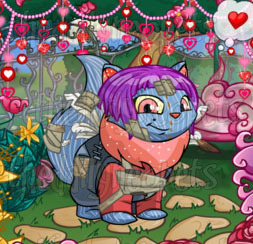 If you cured a random number of pets with Blazingly Hot Soup, you would get the Blazingly Hot Soup Background. Click me to see me full screen! Initially just the news page, but eventually the whole website would have a hazard warning on top of many pages. Click on the image to see the first time the hazard warning was spotted. 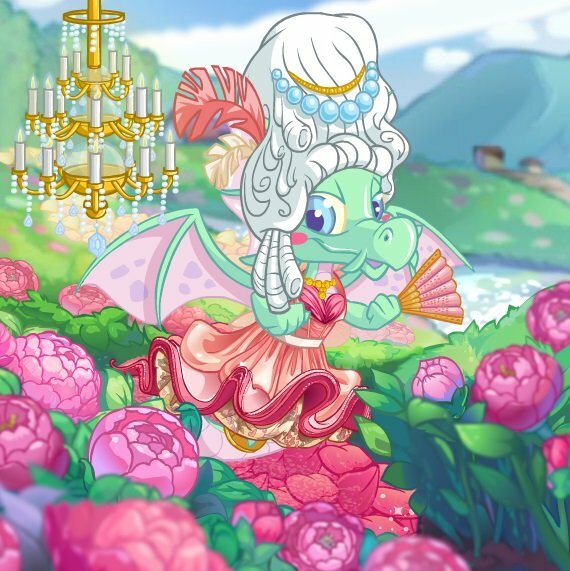 If you went and check the customisation for your pet, you could remove the disease... However if would be back within seconds after removing it. The same could be done with the cures. On Facebook, a picture was uploaded of Mr. Insane, who was hit by Scourgies as well. 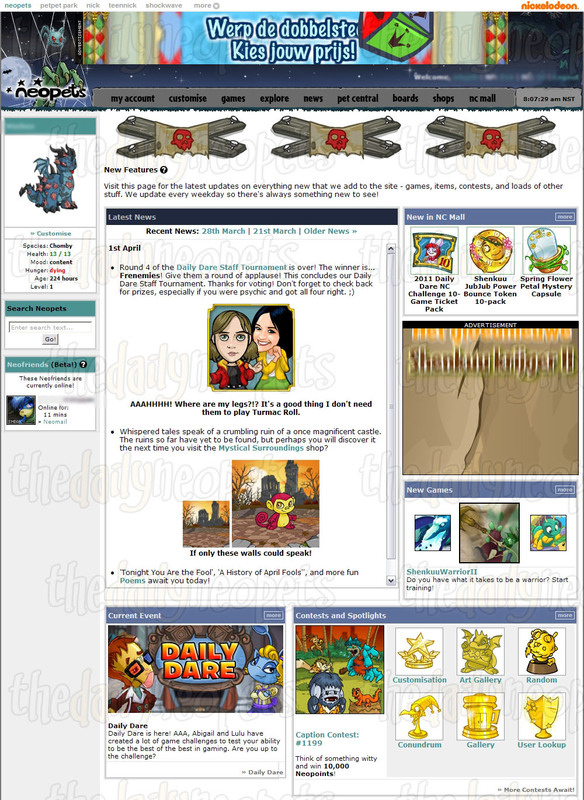 Obviously, the Neopian Times felt like throwing in their own joke as well, and featured several articles of games and fun things to do on Lutari Island. 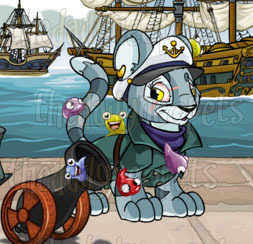 As much as some Neopians had hoped, Lutari Island remained closed. 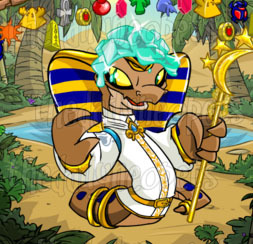 Click here to see the Neopian Times of that week. The Snowager is awake. He'll be sleeping in 2 hours, 9 minutes.